Infinite Monkey Theorem owner Ben Parsons works inside the winery. In an industry where stereotypes have shaped the landscape, one Colorado business has shattered all preconceptions of a 21st century winery. Exclusivity, age and location have long ruled the wine game. Stroll down most wine aisles and you might wish for an oenology degree to decipher the bottle-lined shelves. Despite this status quo, when Ben Parsons opened The Infinite Monkey Theorem (IMT), he decided on a different approach. As Parsons puts it, “Our experiment presented a middle finger to the pretentiousness of the wine industry.” Ten years later, IMT has graduated from humble beginnings in a back alley of Denver’s Santa Fe District to prime River North Arts District digs, and expansions along the Front Range and into Texas. Parsons began his wine career in London as a Bordeaux wine specialist. He cut his teeth selling wines that could cost thousands of British pounds. It was selling these “fancy” and, in his opinion, over-priced wines that pushed him to move to New Zealand and study winemaking. Bringing this idea to fruition, Parsons gathered investors and founded IMT in 2008. The goal was to make the best wine possible with Colorado fruit, and to make wine relevant to those outside the sometimes snobbish wine community. IMT was crafted to be diametrically opposed to establishment wineries. Wine on tap and in cans, chaotic Banksy-esque branding and an urban location all ran counterculture to tradition. 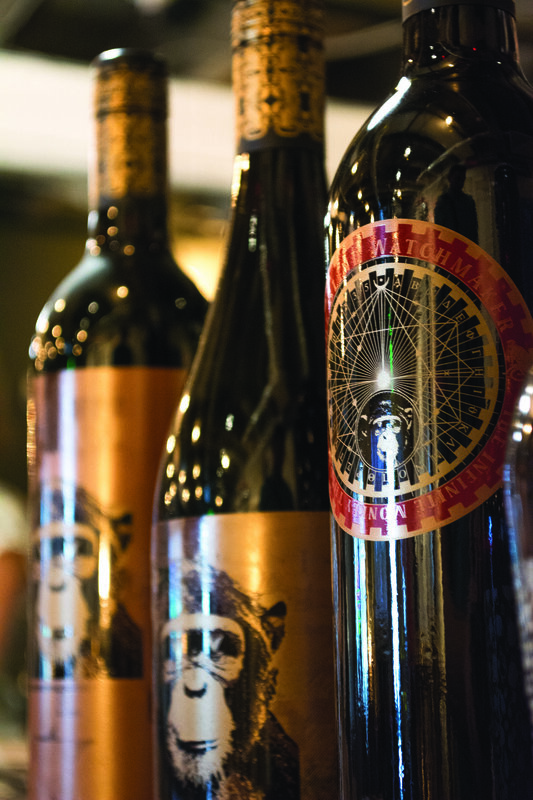 In its first year, IMT produced 2,000 cases of wine off North Santa Fe Drive. Parsons traveled the country for used equipment to get the back-alley winery going. IMT gained steam quickly by selling to Table 6 and other Denver restaurants that wanted a local wine option. Infinite Monkey Theorem owner Ben Parsons checks out the community garden at the RiNo winery. Two years later, Parsons began a crusade that made wine history. In 2010, IMT began working with local canning experts at Ball Corp. Several months of testing with industry experts led to the launch of two canned wines. Fast forward to 2019, and IMT now distributes eight canned products in 42 states. And the initial 2,000 cases has grown to 5,000 cases of bottled wine, 4,000 kegs and 80,000 cases of cans. Parsons points to Dale Katechis from Oskar Blues Brewery as the inspiration behind canning his wines. Oskar Blues launched a revolution in canned craft beer that transferred neatly to Parsons’ “wine for the ordinary person” model. The rest of the wine industry agrees; more than 200 wineries are now canning, according to Parsons. As for the quality? Parsons says wine that is ready to be consumed early (i.e., un-aged) is better in a can. Wine in a can is about instant satisfaction and a single-serving portion. When you are out on the trail or just home from work, sometimes you just need one glass of wine. “It just makes sense,” says Parsons. In 2012, IMT moved to Larimer Street. If you visit, the first thing you might notice is that IMT has a great garden but no grape vines. Parsons believes the lack of a vineyard is a strength, and it certainly doesn’t stop them from getting the grapes they want. IMT uses 100-percent Colorado fruit in nine of its 10 wines. Parsons sources his grapes from Western Slope wineries he has worked with for more than 15 years. 6 a.m. to the RiNo winery. It’s a painstaking process. “Making wine in Colorado is chaotic. It’s my job to make order out of chaos,” says Parsons. Parsons presents freshly pressed grape skins inside the winery. Does it sound like you need a little chaos in your life? Well Parsons is making that easier. IMT is still growing, and recently expanded to Stapleton’s Stanley Marketplace and Fort Collins. IMT also opened another winery in Austin, and a new taproom is in the works for Dallas’ Deep Ellum neighborhood. Check out the Infinite Monkey Theorem main tasting room at 3200 Larimer St., where you can find wine, food trucks and DJ’s on weekends. Neill Pieper uses his considerable thirst for the craft beer scene to provide editorial, marketing and photography at Thirst Colorado. Eat Your Bugs and Drink with ‘Em Too!